Lee returns home to Franklin Street after a bummer of a surrender, during which Grant made strides towards reunifying the two halves of a bloodied nation. During the week leading up to April 9th, 1865, the fortunes of the Confederacy officially went from bad to worse to more or less finished. 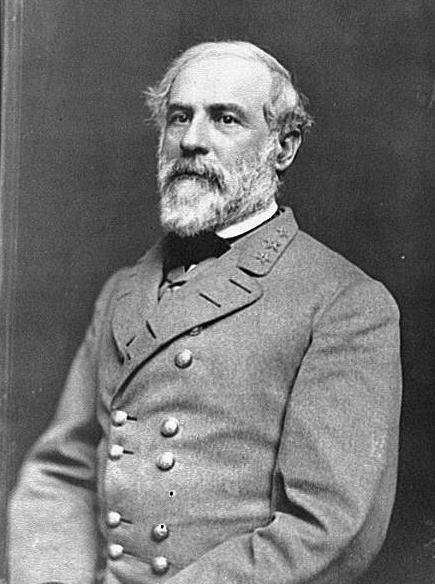 During the overnight hours of April 2nd, Confederate Gen. Robert E. Lee finally made the difficult but inevitable decision to abandon Petersburg and Richmond in order to save his army. By the morning of April 3rd, the Confederate siegeworks were completely abandoned and Lee’s army was marching west through southern Virginia, with a plan to inevitably join up with Gen. Joseph E. Johnston’s army in North Carolina. Spirits in the army were initially high-they were finally back on the march and away from the muddy trenches of Petersburg. But that only lasted about a day. Lee’s first priority was to feed his evacuating army, but the rations he expected from Richmond never arrived. Foraging parties sent out to secure food from local farms came back largely empty-handed. These foraging efforts took the better part of a day and soon an even bigger problem emerged for the fleeing Confederate army. The pursuing Union army had caught up to them. After a few more days of trying to break free of Grant’s grip, Lee’s army had nothing left to give. Lee and Grant exchanged several letters, ultimately deciding to meet on April 9th at Appomattox Courthouse to discuss the terms of surrender for Lee’s Army of Northern Virginia. The two men met in the parlor of a local home, Lee resplendent in his general’s uniform complete with an ornate sword and Grant plainly-dressed in a private’s uniform. It was there that Grant laid out the details of the surrender. All Confederate soldiers in the Army of Northern Virginia, including Lee himself, were paroled and free to return home. Soldiers were required to surrender their rifles, but officers were allowed to keep sidearms and swords. In addition, Grant arranged to have rations sent immediately to feed the starving Confederate soldiers. This charitable approach to the surrendered Confederates, now seen by Grant as “reunited countrymen,” reflected President Abraham Lincoln’s desire for reunification with the Southern states and a peaceful end to the war. Had the Union taken a more hardline approach, they could have easily ordered Lee (and other Confederate officers) arrested or sentenced to death. Instead, Lee stayed in Appomattox Courthouse until the last of his soldiers had been paroled and then returned home to Richmond. Lee entered into Richmond on April 15th, riding his horse Traveller across the James River on a Union-built pontoon bridge (all the original bridges had been destroyed by the evacuating Confederates). As he rode through the city, he surveyed the fire-damaged business district, making his way to his residence at 707 N. Franklin Street. As he passed, an impromptu crowd formed on the streets to cheer his return. Lee acknowledged the crowd with a tip of his hat, but unlike Lincoln a few days earlier, made no remarks to the gathered audience. In the days that followed, Lee remained reclusive in his home, wanting to shy away from any attention from the citizens of Richmond. One person, however, was granted a pretty remarkable exception. Famous Civil War photographer Matthew Brady had been in Richmond for several days taking photos of the destruction in the city and made a request of the Lee family to photograph the general in his home. Lee, who normally found posing for photographs “irksome”, agreed to Brady’s request. It must have taken some courage to recognize the historical significance of the occasion and some steeliness to put aside his post-surrender emotions. Brady took six photographs of Lee on Easter Sunday in his home. The photos, showing an aged and war-weary Lee, are some of the best-known ever taken of the general. Unlike so many of the Richmond buildings/houses mentioned during this column’s four years of existence, Lee’s row house at 707 E. Franklin Street still stands, nestled between a parking lot and an office building, just a short walk from the state capitol. It’s almost invisible unless you know what you’re looking for. It seems a real shame that now that peace is finally becoming a real thing for Richmond, this column must come to an end. But end it must! Join Phil on Monday, April 27th for the FINAL INSTALLMENT of our sesquicentennial remembrance. Need to catch up? Read it allllllllll here.